Service was responsive and friendly. Would use again. Jamie. Excellent. Accommodating and extremely knowledgeable. A pleasure to deal with. Good communication - item received in excellent condition - a dealer I highly recommend. IPM Group and its affiliates in Singapore, London and Malaysia are dealing solely in the supply of physical precious metals, a large product range across 5 metal groups (Gold, Silver, Platinum, Palladium & Rhodium). We offer a simple asset diversification opportunity, both in the form of direct delivery to our customers and in storage opportunities at fully allocated vaults operated by one of World’s safest storage facilities in Singapore Freeport. We are official distributors to the refiners Baird & Co. Mint London and Swiss Bullion Corp AG Switzerland, covering their full precious metals product range. Please see their website distibutors page by clicking their respective logos below. Also our Authorised Supplier Letters can be viewed by clicking the links below. Official Distributor of Baird & Co.
Official Distributor of Swiss Bullion Corp AG. We pride ourselves on our relationships with our customer base, hence when developing our customer focused business plan we have concentrated on one single element above all else - simplicity. We believe in customer service and user-friendly navigation of our e-commerce site, which we have developed over a lengthy period of time, with overall client experience and simplicity foremost in our thoughts. We continue to develop the site making changes where applicable to benefit the customer experience. We offer a number of differing methods in which customers may take ownership of their physical metals that best suits individual demands. The team at IPM Group (indigopreciousmetals.com) has many decades of experience in the banking industry working directly in investment and trading, across many asset class markets on behalf of the banks and bank clients. We deal with precious metals on a daily basis, including buying, selling, transporting, storing and insuring them. We are open to taking calls from our customer base to communicate on how best to purchase these investment products, but more importantly which products best suit their requirements. We hold distributor contracts with the refiners themselves, hence there is no third party that has become between the origination and creation of these products and to the customers themselves. Not only does this instill or guarantee trust in the quality of the product itself, but we can also reduce the margins between the source refiner to customer prices offered. Our companies are situated in Singapore, London and Malaysia representing regions of the World that recognizes the importance of ‘Precious Metals’ as ‘Investment Products’ in their own right, hence they are free of GST (Goods and Services Tax) and also capital gains tax. This gives our customers a supremely confident investment foundation on which to make sound decisions. We offer customer allocated* storage in one of the World’s most secure vaults at very low cost. If you wish to read more fully the outstanding advantages (tax, liquidty, logistics and ease) of this facility then please read here. Singapore Freeport is a super-secure, state-of-the-art facility that operates in its own duty-free zone next to Singapore's Changi Airport. The largest such facility in the world. 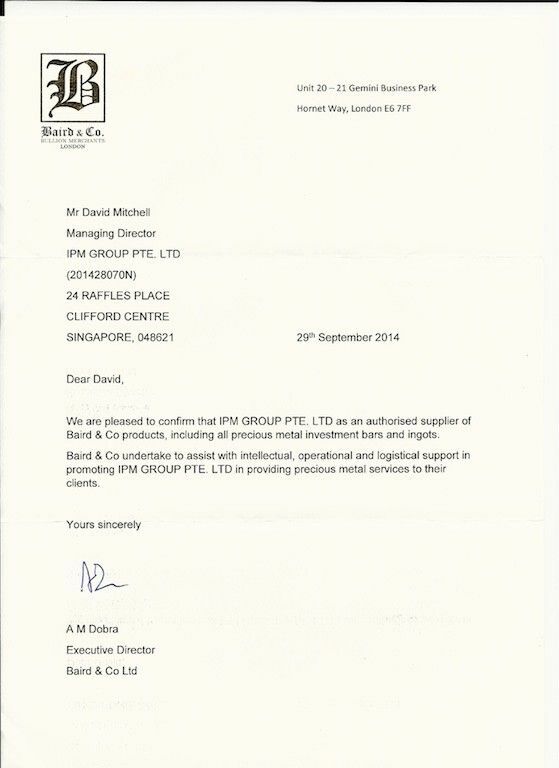 An article on the "Vaulting Protection of Your Wealth in Singapore with IPM Group"
Customers fully allocated holdings will be held in IPM Groups ‘segregated allocated’ storage vault facility within Singapore Le Freeport facilities. Allocated account customers receive quarterly statements and invoices. Allocated bars may be withdrawn from storage for collection at ‘Singapore Freeport’ premises, subject to 24 hours prior notice. Allocated precious metals (gold, silver etc.) are fully covered by insurance to the full value of the holdings at present world prices. * Definition: “Allocated” precious metals are owned outright by the investor and are stored, under a safekeeping or custody arrangement, in a professional vault. It is the sole property of the investor and by law is segregated. “Allocated” holdings differ profoundly from “Unallocated” holdings. Customers can visit the Freeport facility themselves and physically remove their gold on request. 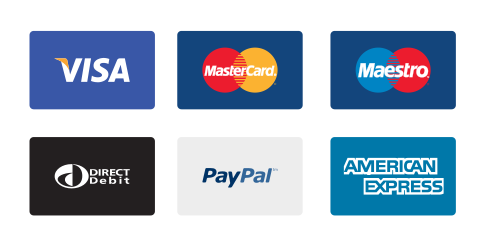 We offer our customers the opportunity to pre-credit balances into their own accounts, which can be viewed online using your own personal login details. This facility is purely for the customer’s assistance as we are aware that it takes times for funds to be moved over (especially considering US$ clearing times) and you may wish to pre-empt a purchase of physical metals at a price that suits you. This credit balance will automatically push your purchase through and guarantee the price and delivery of your products. See here for more details. You can request for your bullion to be delivered via our trusted logistic agents such as Brinks, FedEx and UPS. Secure in the knowledge your investment will be delivered to your door safely and fully insured. We went to great lengths to negotiate the best deals possible on behalf of our customers for deliveries. We deliver across Singapore, UK, Europe, America's, Canada, and throughout Asia. Deliveries across Asia and Europe customers will be personally liable for any GST relating to the country of delivery in question. Pick ups - We also offer our customers the opportunity of physically picking up their order directly from the vaulting facility in Singapore, this will be by prior arranged appointments to make sure package is ready. Customers can obtain the latest investment news, live pricing, and exclusive offers through our e-commerce site and email newsletters. The investment in bullion coins is a time-honored method of preserving wealth. We also offer a full range of investment grade bars, but considering our close business relationship with Baird & Co. refiners of London, we can also offer more specialised precious metal products, such as your own design of coins. Please contact us directly for more information. Central Banks around the World are accumulating Gold as part of their reserves, this overall net buying which has been taking place since 2010 has not been seen in such size since the 1960’s. Most recently, the year 2014 was the 2nd largest buying spree by CB’s in over 50 years ! The vast majority of the World’s Central Banks holds the metal as reserve requirement diversification on their balance sheets in physical holdings and have been accumulating 1,000’s of tons of the metal over just the last few years alone! Gold / precious metals hold no 3rd party liability (unlike any other monetary asset) and considered the only true safe collateral in times of crisis. Rather than Gold being the pre-eminent monetary inflation proof trade, it’s quite simply crisis insurance and a wealth preservation vehicle. Considering the deteriorating World macro economic picture we find ourselves in (this will be covered daily on our news blog), we at IPM consider ‘fully allocated physical’ holdings as a compulsory part of ones overall asset portfolio, as it has been historically. We believe that asset portfolios should hold between 5% to 15% within this wealth preservation vehicle of precious metals, although some individuals insist on taking a much higher weighted position considering the World backdrop. We also break down that position % into different metals and not just Gold, as they all have their own particular demand qualities and supply constraints. Why Own Real Physical Metals Over Paper Gold / Silver etc… ? The simple answer is 'counterparty risk' ! What if you thought you were saving gold, only to learn too late that you were merely saving counter-party risks with a bank or financial institution? Paper Gold is a short term trading product and not a long-term wealth preservation asset, especially in times of crisis. Avoid as much as possible paper gold or silver or at least be very careful when you do so. Paper gold and silver became very popular because of their ease of use, but they don’t come without risks. Yes there are simple instruments like the ETF’s GLD and SLV that you can buy on the stock exchange, but again be very careful, we at IPM have studied the prospectus of the major ETF’s such as GLD and we personally would not hold our gold investment allocation with them…..
"In addition, the ability of the Trustee to monitor the performance of the Custodian may be limited because under the Custody Agreement the Trustee has only limited rights to visit the premises of the Custodian for the purpose of examining the Trust’s gold"
As a general principle, you should remember to own your gold and silver outside the financial system. If you want an example of what can go wrong when investing in paper gold, then have a look at the drama that occurred with MF Global. The term paper gold means you have a piece of paper acting as a substitute for physical gold. With paper gold, you don't own gold; in most cases you don't even own a promise to receive physical gold, you are a creditor of the party issuing the paper gold certificate or account, and thus subject to a myriad of counter-party risks and potential bankruptcy. Examples of paper gold are gold certificates issued by banks and mints, passbook gold accounts, pool accounts, futures accounts and many of the well-known ETFs ‘Exchange Traded Funds’. Many large banks in Asia offer what are popularly referred to as paper gold accounts or passbook gold accounts. Unlike outright physical gold bullion ownership, paper gold accounts and passbook gold accounts are anything but bullion. It could be referred to as a right to possess physical gold at a particular time in the future. However, there are always some conditions that have to be met before the promise to receive a certain amount of physical gold can actually be fulfilled. Unlike passbook gold or paper gold, physical gold bullion in hand cannot go bankrupt and has no dependency on any other entity(s) fulfilling promises made. Why would you take that risk ? Money is, essentially, a medium of exchange, a unit of account, and a store of value. Many things have been used as money — seashells, salt, nails, cigarettes, enormous stone wheels, and of course gold and silver. Historically, gold and silver have been the most widely accepted, and these metals have maintained their purchasing power more reliably in the long run than any government-issued paper in history. At the same time, understanding gold's widespread and continuous historical appeal may justifiably lead to the modern use of gold as a part of a portfolio of financial assets. This remarkably long-run consistency with which gold is valued across time and cultures is evidence, not of the presence of intrinsic value, but of the fact that gold satisfies some very basic intermediate goals. Take into consideration that 1.2 billion Chinese, 1.0 billion Indians and 1.1 billion Arabs, who make up approximately 60% of the planets population, who’s populous has a deep ingrained affinity to gold. These facts really cannot be so easily brushed aside.